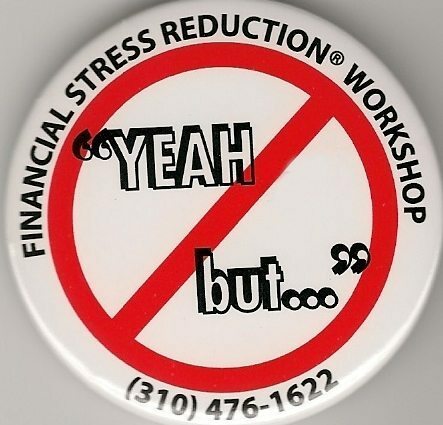 I had buttons made for my workshops that have the words “Yeah, but” on them surrounded by a red circle with a red line through it—“No yeah, buts.” I explain that that phrase is not allowed in my classroom. So during each class, when someone is offered advice and forgets and says, “Yeah, but…” I throw them a button. Sometimes, with incorrigible Yeahbutters, other people in the class get up, grab a button and throw it at them. People have been known to leave class wearing eight or ten buttons! You will find yourself getting richer and happier when you eliminate the words “yeah, but” from your vocabulary. Instead of “Yeah, but” say, “Thank you for the suggestion! Help me see how I can apply that to my situation.” Now you have two people working on the problem side by side, instead of two people, with the problem between them, arguing about it. Think you can make it through today without one “yeah, but”?